From the late 1950s diesel locomotives started to replace steam traction on Britain's railway network. By 1968 the transition was complete and the diesel locomotive reigned supreme, pulling everything from the major express services to the local freights. In turn these early diesel locomotives have been replaced by multiple units. Fortunately you can still see a wide selection of heritage diesel traction in action on the GWSR. D8137 (20137) - Class 20 Diesel Electric Locomotive. D8137 is privately owned and is a permanent resident on the GWR. D8137 was purchased from British Rail at Wigan in 1994 and moved to the GWR. D8137 was returned to working order in 1995. Built by English Electric at Newton-le-Willows in 1966. English Electric 8SVT Mk.II, Turbo-charged, 1000hp at 850rpm. Power equipment by English Electric. 5081 (24081) is privately owned and is a permanent resident on the GWR. 24081 was preserved in 1981 and has remained operational throughout its life in preservation. It will be out of service during 2019 for bogie refurbishment. Sulzer type 2 locomotive built by British Rail at Crewe in 1960. Sulzer 6LDA28A, turbo-charged, four-stroke, 1160hp at 750rpm. Power equipment by A.E.I. and B.T.H. 26043 (D5343) - Class 26 Diesel Electric Locomotive. This locomotive is owned by The Cotswold Mainline Diesel Group and is a permanent resident on the GWR. 26043 ran for the first time in preservation during the 2013 Heritage Diesel Weekend. Sulzer type 2 Diesel Electric Locomotive built by the Birmingham Railway Carriage & Wagon Company in 1959. Sulzer 6LDA28A, turbo-charged, producing 1160hp at 750rpm. Power equipment by Crompton Parkinson. D6948 (37248), a Class 37/0 Diesel Electric Locomotive, is owned by four individuals who are both Growler Group members and active working members of the GWR diesel department and is a permanent resident on the GWR. 37248 came to Toddington in 2010 and has undergone an extensive refurbishment including the provision of steam heating and a return to BR green. English Electric type 3 locomotive built by English Electric at Newton-le-Willows in 1964. English Electric 12CSVT, Turbo-charged and Intercooled, 1750hp at 850rpm. Power equipment by English Electric. 37215 (D6915), a Class 37/0 Diesel Electric Locomotive, is owned by The Growler Group and is a permanent resident on the GWR. 37215 was preserved in 1994 and was returned to working order in 1998. English Electric type 3 locomotive built by English Electric at Newton-le-Willows in 1963. 45149 (D135) - Class 45/1 Diesel Electric Locomotive. This locomotive is owned by The Cotswold Mainline Diesel Group and is a permanent resident on the GWR. It first ran in preservation during the 2013 Heritage Diesel Weekend. British Railways. Sulzer type 4 Diesel Electric Locomotive built by British Rail at Crewe in 1961. Sulzer 12LDA28-B, turbo-charged and intercooled, producing 2500hp at 750rpm. Power equipment by Crompton Parkinson (ETH equipment by Brush). 47376 (D1895) is owned by The Brush Type 4 Fund and is a permanent resident on the GWR. The Brush Type 4 Fund was formed in 1992 and, in November 2002, bought No 47376. The loco was transported to the GWR in 2003 after receiving a replacement engine at Ashchurch from sister loco No 47295. Brush type 4 Diesel Electric Locomotive built by Brush Electrical Machines Ltd at Loughborough in 1965. Sulzer 12LDA28-C, Turbo-charged, Inter-cooled, 2580hp at 750rpm. Power equipment by Brush. E6036 (73129) is currently based on the GWR and spends most of its time hauling the permanent way train, although it also takes its turn on passenger train duties. One of a class of 49 'electro-diesels' introduced in 1962 and built by Vulcan Foundry to work on the Southern Region. These locos can use either their own, internal, diesel engine or pick up a 750 volt third-rail supply.No 73129 was withdrawn in 2002 after spending the previous 20 years carrying the name 'City of Winchester' working initially for London and South Eastern and then Network SouthEast. English Electric 4-cyl 4SRKT Mk II diesel rated at 600 bhp. 4 English Electric 546/1B traction motors each rated at 400 hp. One of a class of 230 British Railways diesel mechanical shunting locomotives built between 1957 and 1962. D2182 was built in 1962 at Swindon. Gardner 8-cylinder, 4-stroke 8L3 of 204 hp. Wilson-Drewry CA5 R7, 5-speed epicyclic gearbox and jackshaft drive. 11230 arrived on the GWSR in 2003 and is now working at Toddington with its restoration almost complete. One of a pair of Drewry industrial shunters that worked most of their lives at the Willington power station, it has been restored to represent a member of British Railways' 04 Class in its original livery and numbering system. D2280 arrived on the GWSR in 2018 and is now part of the shunting fleet at Toddington. There is a Bachman model of this locomotive available in BR green. Built in 1960 for British Railways, it was sold to the Ford Motor Company for industrial use in 1971 and renumbered as No 2. It was withdrawn from service in 1996. 372 arrived at Toddington in October 1999 and since then has been used extensively as yard shunter. During the time it has been here it has received extensive work including repainting into pseudo BR blue livery as well as numerous mechanical improvements. DES has been a strong, powerful and reliable shunter but is currently out of service for a wheel bearing replacement. Built by the Yorkshire Engine Company, Sheffield in 1959, works number YE2760. New to Port of London Authority as PLA235 before transfer to Allied Steel & Wire Cardiff in 1971 where it became no 372 and named Bamborough. Rolls Royce C8SFL 8-cylinder supercharged engine of 320hp. BTH electrical gear driving 2 traction motors. 47105 (D1693) is owned by The Brush Type 4 Fund and is a permanent resident on the GWR. 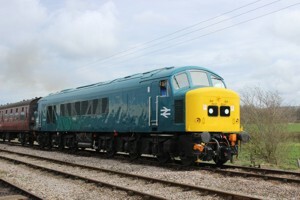 The Brush Type 4 Fund was formed in 1992 with the aim of preserving a Series Parallel Class 47, after 2 years of fund raising 47105 was bought from Crewe in January 1994. The loco was transported to the GWR in April '94 and started for the first time in preservation 1 month later. Since 1994 much work has been carried out on the loco culminating in the re-instatement of the steam heat boiler, making '105 the first Class 47 to steam since 1987. It is currently undergoing a major overhaul. Brush type 4 Diesel Electric Locomotive built by Brush Electrical Machines Ltd at Loughborough in 1963.